Shawn Kenelty chats with students in Mrs. Buck’s class about their new books. PABLO – Cookies and heart-shaped candies are the predictable gifts elementary students receive on Valentine’s Day. 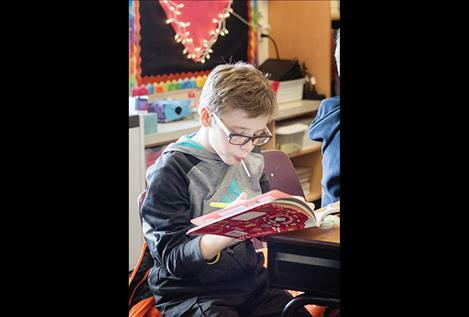 The fourth-grade classes of both Mrs. Buck and Ms. Fisher at Pablo Elementary School received something more than the normal Valentine’s Day fanfare on Thursday. Each of the more than two dozen students received a book from the program called “Book A Valentine” created by the Ronan Public Library. 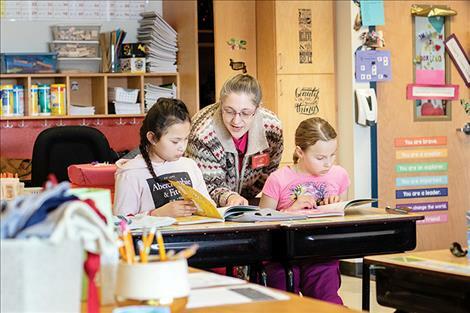 The inaugural “Book A Valentine” program is funded in part by monetary donations from the community and a grant matching program supported by Literacy for Lifetime and Usborne Books. “In the past, in February, for ‘I Love to Read’ month, we would ask community members to purchase books for the library to add to our collection. This year we decided to do a little something different,” said Fenger. Shawn Kenelty, local Usborne Book representative joined Fenger in passing out the books to the kids. “I am a local book lady who loves getting books into kids’ hands,” Kenelty told the classes before handing out the books. 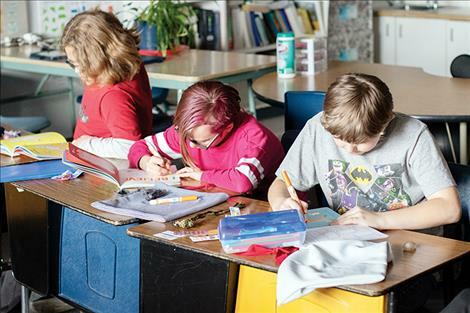 Each student received a crocheted heart shaped bookmarker, a cloth book bag and an interactive self-care activity book from the collection of Mindful Kids by author Sharie Coombes. 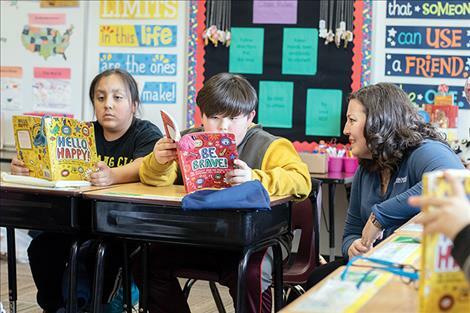 “The reason we chose this particular series of books is that they are interactive and help children with different kinds of issues that they may be dealing with,” Fenger said. The books provide an opportunity for the young reader to combat negative feelings, tackle anxiety, sadness and stress through encouraging and simple writing, coloring, doodling and drawing activities. Fenger hopes the program will grow and be able to give more books to more classes next year.